It is with deep sadness that the family of Robert Michael Pugh announces that he passed away on February 3, 2019, at the age of 74, peacefully after a brief illness. Michael was surrounded in his final days by those he loved and who loved him, and passed with his sister Susan at his bedside. Michael taught English at the University of New Hampshire Manchester for twenty-five years. He loved teaching, reading, family, friends, food, and music, especially opera and particularly Montserrat Caballe. He was beloved by his students, colleagues, friends, and family, all of whom regarded him as deeply kind, gentle man, with a tremendous sense of humor and grand intelligence. He was often amused but never at anybody else's expense. He preferred movies where people who beautiful clothes, used language, and nothing much happened. Michael was born on October 2, 1944, in Chicago, IL. After his father returned from the war, he taught history at Eureka College in Eureka, IL, and then at the University of Illinois, Champaign, IL. Michael's love of music and drama blossomed while he was at Champaign High School when he and his friend Buddy Hedgcock would take the train to Chicago to see live performances of opera and plays. His family lived in Illinois until he completed his junior year in high school, when they moved to Plymouth, NH. His father taught history at Plymouth State College, and his mother rented the 5 extra bedrooms in their 9 bedroom Victorian house on Webster Street to college students. Michael graduated from Plymouth High School in 1962, and was awarded a town scholarship to attend Dartmouth College, Class of 1966. He majored in English and enjoyed performing in several college theatrical productions, usually playing roles like the third spear holder on the right. He rarely got any lines despite his lifelong ability to recite vast passages from Shakespeare by heart. It will surprise no one that knew Michael that he was a Conscientious Objector to the war in Vietnam. He served in the Peace Corps for two years in Nigeria. He remained in Nigeria for four more years, teaching at the Mayflower School in Sokoto and as the director of a camp reuniting families separated during the Biafran War. His time in Africa came to shape his whole way of life-the pace, the simplicity of living, and his deep respect and compassion for other people. When he came home from Africa, he took a job as a caseworker at the NH State Welfare Department in Lebanon, NH, but before long he was off again, this time taking a teaching job for a year in San Pedro Sula, Honduras. This experience allowed him to appreciate that no hot and humid weather for the rest of his life would ever be as hot and humid as it was in Honduras. He earned his master's degree in English in 1986 from William Patterson College in New Jersey, while living with his cousin Sam Plummer and his family, who were always dear to him. He returned to New Hampshire and took a job as a tour guide at Shaker Village in Canterbury, where he became warm friends with the community's last two surviving members, Eldress Bertha Lindsay and Eldress Ethel Hudson. The following year he entered a doctoral program in English at the University of New Hampshire, receiving his Ph.D. in 1994. At UNH he taught composition to students whose first languages were not English, and worked at the University's summer program with students from Shoin Women's College of Kobe, Japan. His experience with the Shakers informed his choice of dissertation subject, focusing on literature with the theme of Shakers and marriage, which he found curious because actual Shakers did not marry. 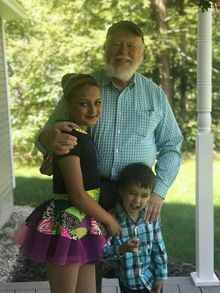 Michael moved to Manchester, NH in 1994, to teach English at St. Anselm's College and the University of New Hampshire Manchester, where he became one of their longest–serving professors. In addition to teaching literature and composition, he coordinated the ESOL Summer Program for adults and the EXCELL program (renamed EXCELL-in-STEM in 2014) for middle and high school students for more than a decade. Michael's legacy lives on through the countless number of English Language Learners he helped to make higher education accessible. He lived with his friend Margo Burns for many years, a time of much laughter and cats who would greet him at the door only to turn away because he was "not her". Their two families were very close, sharing many holidays over the years and spending raucous multi-birthday celebrations together at the Puritan Backroom. Michael moved his mother Marian in to live with them for the final five years of her life. He continued to travel the world into his sixties and seventies, going to Bangladesh to meet the family of his nephew Jared's wife Natasha, attending the wedding of his cousin Will Plummer in France, and touring Brazil with his friends Ran and Lucia Miranda. Michael is survived by his sister, Susan Blanchard of Loudon, NH; his nephew Caleb Yeaton and wife Marianne Schlosser of Vienna, VA; his nephew Jared Yeaton and wife Natasha Husain of Hopkinton, NH; great-niece Helen and three great-nephews Roman, Keith, and Kyle; and several cousins. He was predeceased by his father, Robert Coplin Pugh, born in Shelbyville, IL, and his mother, Marian Blanchard, born in Chicago, IL, whose family was from Peacham, VT. He was a member of the First Congregational Church, Manchester, NH. A memorial service for family and friends to celebrate his life will be held at 2:00 pm on Saturday, April 20, 2019, at the First Congregational Church, 508 Union St., Manchester, NH The University of New Hampshire Manchester will hold a commemoration for students and colleagues at 1:00 pm on Friday, February 22, 2019. In lieu of flowers, his family asks that donations be made in his memory to two charities that fight poverty around the world: Children International (http://children.org) and Heifer International (http://heifer.org). The University of New Hampshire has established a memorial gift fund in his name to provide financial support for youths, high school students, and adults in their ESOL summer programs in Manchester (http://unh.edu/give/manchester).